IVF - an investment in the future? IVF treatment can, as everyone knows, be very expensive. If your insurance policy does not cover invitro fertilization, or only a very limited number of cycles, you may quickly just to the conclusion that IVF is not within your reach. 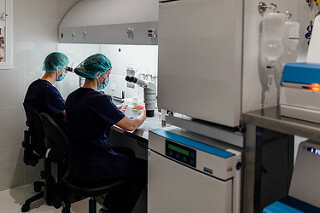 But, many fertility clinics have a monthly repayment option, and obtaining a loan from your bank may be an even more viable option to make the fertility treatment you need to have a baby available to you. A friend of mine is currently going through IVF treatment, with Intracytoplasmic Sperm Injection (ICSI). After trying herbal supplements and other lifestyle changes to increase her partner's sperm count, they came to the conclusion that getting pregnant naturally was not going to work for them. My friend, however much she wants a baby, was not immediately sold on IVF. They looked into fertility tourism all around the world, including in India and the Ukraine, to see if there was any way to make invitro fertilization and ICSI cheaper. In the end, they opted to receive IVF treatments in the United States though. My friend was no longer so concerned about finances. Why? In a society where almost everyone has taken on debts including car repayments, student loans, and mortgage repayments, as well as other personal loans and credit card debts the repayments this couple will be making is not unusual. Since they don't have car repayments, or student debts, the repayments they will be making for IVF will be very manageable. If you, too, have been worrying about how to afford fertility treatment, this mindset may be of help to you. IVF can be seen as an investment in the future, much like any other big financial decision you make. These days, all kinds of people spend money on all kinds of things, which are often unnecessary. What thing is there in life that is more worth spending money on than starting a family? IVF and ICSI Increases the Risk of Stillbirth - Or Not?